From this morning, Operation Brock has been brought in on the M20 as an extra tool for managing disruption in Kent. The M20 contraflow will be in effect from north of Junction 8 (for Maidstone) to Junction 9 at Ashford. Operation Brock queues lorries bound for mainland Europe on the coastbound M20 and uses a contraflow on the London-bound carriageway to enable other traffic to travel in both directions. Traditionally when there has been severe disruption to cross-channel services, sections of the M20 have been closed and used to queue HGVs heading for mainland Europe, under arrangements known as Operation Stack. Lorries heading for mainland Europe will be routed down the coastbound carriageway, with a 30mph speed limit in place. All other traffic will be directed onto the London-bound carriageway, with two lanes in each direction operating at 50mph. 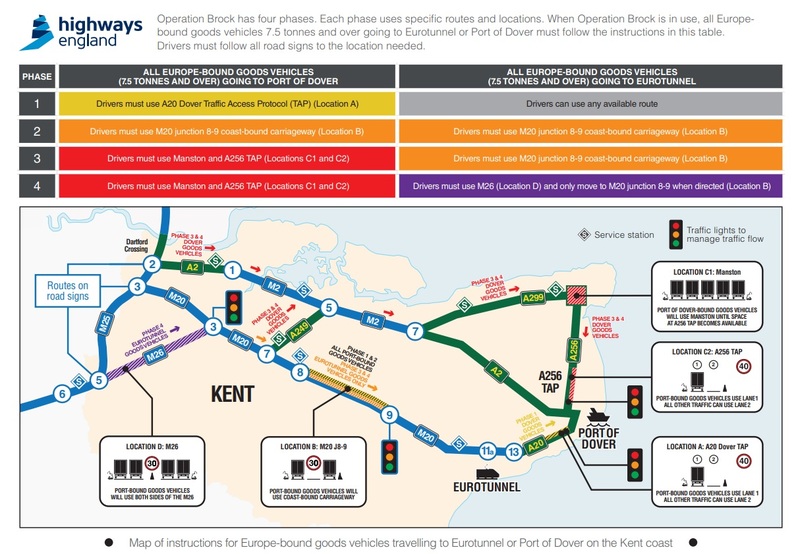 The deployment will help to demonstrate Kent’s preparedness for disruption and allow the contraflow to be in place for any traffic disruption in the coming weeks. Three lanes in each direction could be restored, with a 50mph limit, if Operation Brock is assessed as unlikely to be required in the following weeks. From today, drivers will need to follow the different layout on the M20 from just north of Junction 8 (for Leeds) to Junction 9 (Ashford). For the preparations for the M26, there will be overnight closures on the weekend of 30 March. Operation Brock has stages that can be deployed sequentially, scaling up or down to meet demand.